Ever since we've moved to Charlotte I've been ever so slightly obsessed with the uptown horse drawn carriage rides. 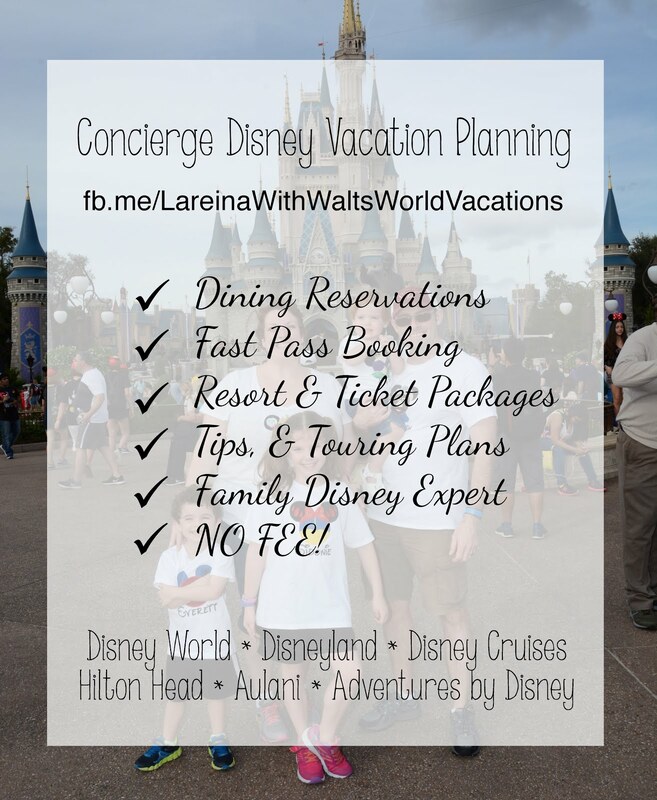 There is something so nostalgic and fun about carriage rides, very ala Disney princess. I'd been telling my husband that we really needed to check it out, but each time we were uptown the conditions just weren't ideal to catch a ride. The stars finally aligned and we were able to bring our little princess on the carriage ride. All of the carriages are private, and we took the 20 minute ride just in case S wasn't as keen on it as we thought she would be. Everyone really enjoyed it, and S thought it was amazing that we were riding a horse in the streets of Charlotte. She still talks about it and points it out any time we are uptown. The carriage tours are running most evenings all week long and some afternoons on the weekends weather permitting. You can call 704-301-5111 before heading out to make sure they are open. They are located at the corner of Trade and Tryon Streets. 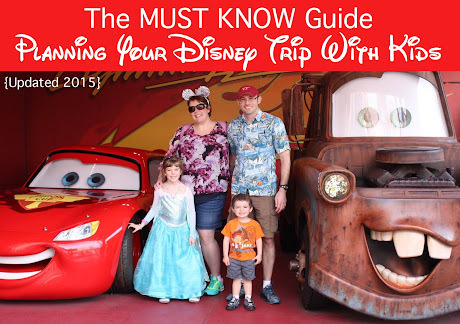 Bundle the family up for a memorable, educational and affordable experience uptown. Momma Tip: There can be a wait, if it's substantial enough have your hubby wait while you take the kids to the free Wells Fargo History Museum just 4 blocks away at 401 South Tryon Street. It's a great place for the kids to run around. 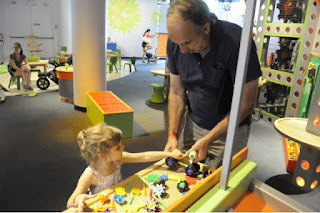 One of our favorite places in Charlotte is Discovery Place. 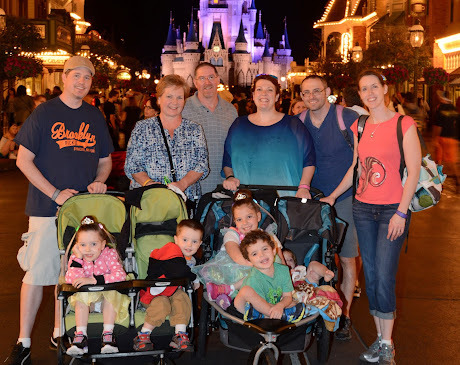 We've had a membership since we moved here, and its always been a fun and different experience each time we've visited. 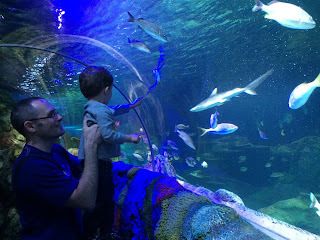 This year we purchased the WNC membership which was cheaper than joining Discover Place ($62 vs $100), and has reciprocal entry for Discovery Place and the Riverbanks Zoo (savings!!) in addition to several other museums - a great deal. Regular tickets cost $12 for adults, $10 for kids, under 2 are free. 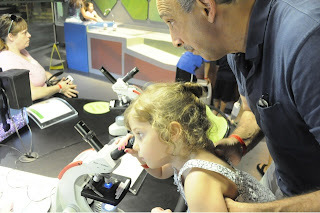 My father joined us for some science fun the last time we went. Discovery Place has many rotating educational programs, interactive experiences and multi-sensory stations. 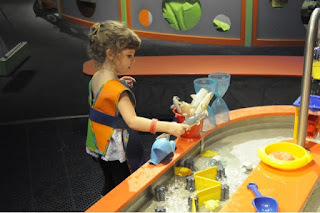 The water table is one of S's favorite places to play, they supply aprons but I recommend bringing an outfit change. There is an area to construct cars and race them, a drum set made out of kitchen supplies, a place for kids to dress up as super heroes and "fly" with their costumes on. The magnetic building area allows kids to explore shapes and construction, as does the magnetic ball drop. A children under 3 area is covered with padded foam and fun for the littlest of ones to crawl and roll around in. Science is integrated throughout, with microscopes to view every day objects and numerous stations that explain scientific principles to many age levels. My favorite part is the aquarium, I love watching the jelly fish as they elegantly float along. We had an animal encounter with a snake and a crab, S enjoyed petting both. You can catch an IMAX movie while you're there (for an additional cost), and catch a bite to eat at their cafe or bring a snack with you. It's easy to spend hours exploring all there is to see, and still not see all they have to offer. It's a must see for kids, parents and grandparents in Charlotte. 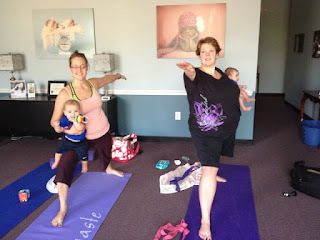 My sister in law and I enjoyed a mommy baby yoga class at the Carolina Community Maternity Center. They hold this class on Saturdays from 10:30-12. It was relaxing to be in an environment where other moms were sharing their positive energy and breathing together right beside their babies. I loved that it was totally kosher when I had to stop and nurse and change E's diaper for a few moments, and then was able to rejoin my yoga practice. The cost was $8, but it may range depending on if you purchase a punch card. There were babies of all ages, and the maternity center had a very loving and holistic ambiance as we were surrounded by infant pictures and a beautiful belly cast art display. The babies seemed to enjoy it as much as we did. Joan the instructor was very sweet, informative and welcoming. The location is convenient, just off of the Gold Hill exit of I-77. They had mats available for newbies and many other programs that the center offers including midwifery, infant massage classes, baby sign language classes and other maternity related education. Contact: Joan at charlotteprenatalyoga@gmail.com or call 704.618.0421. So it's not exactly Charlotte, but instead a day trip from Charlotte. 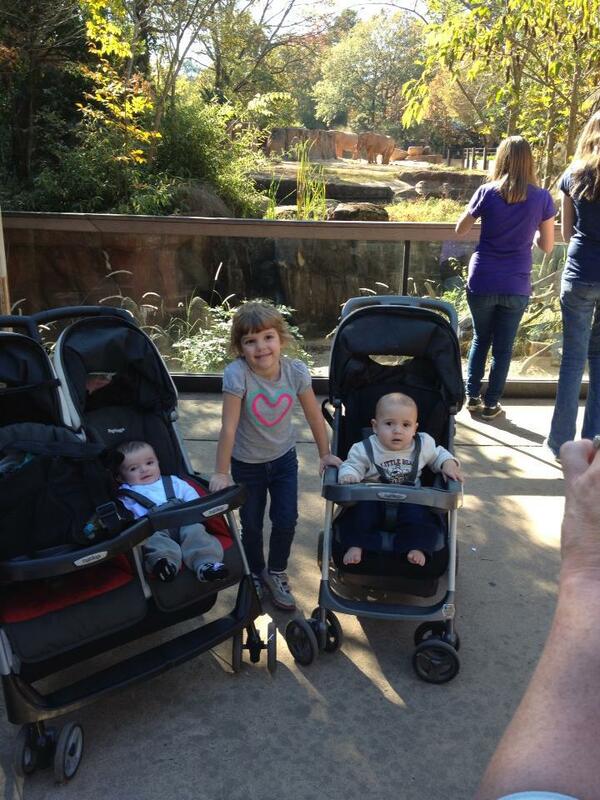 It's the Riverbanks Zoo and it's well worth the hour and 30 minute drive. We all packed in the minivan, packed a lunch and headed to Columbia. The drive is easy, a straight shot on Rt. 77 nearly the entire way. The zoo is just the right size, not too big and not too small - with cute up close and personal animal encounters. They have all the standards - lions and tigers and bears (OH MY!) as well as some cute little waddlers in tuxedos and a gorgeous botanical garden that is well worth the hike (AND ITS A HIKE) up to it, or be smarter than us and take the tram up! The animals at this zoo all seem very up close and accessible. We checked out the gorilla feeding which happened at 11:30, and the huge silver back was just on the other side of the glass and S was mesmerized as the zoo keeper talked about all things gorilla. The penguins are always so cute as they waddle and swim around and were putting on quite a show. The monkeys swung on their ropes and howled while the lions and tigers lazed around blending in with their surroundings. I missed the reptile area because I was nursing the baby, (oh darn) but S reveled at the HUGA-MONGOUS snake that was there. My favorite exhibit was the koala bears, they were perched up on their trees looking very zen and cuddly. The botanical garden was very opulent and well labeled, there wasn't a plant that didn't have a name! There was a play ground area there as well as at the main part of the zoo for kids to run off some more steam. It's everything that a zoo should be, and it's clean and well maintained with changing areas in the bathrooms for the little ones. The food there wasn't very appetizing, and quite pricey so we were glad we brought a lunch to eat. Cost: 12+ $11.75, 3-12 $9.25, under 3 free. We joined the WNC (http://www.wildwnc.org/become-a-member/become-a-member) for a family membership costing $62, which has reciprocal privileges at the Riverbanks Zoo and 275+ other museums and zoos around the country, so we paid nothing that day. 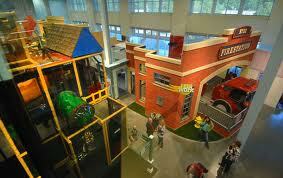 Discovery Place (not kids) is also a reciprocal museum in Charlotte. The Charlotte Nature Museum is a tucked away little gem near uptown Charlotte. We visited while they were having their Easter celebration. They had bunnies and baby chicks to pet, cute Easter themed crafts, and face painting. Their typical admission includes lots of nature with animals and creatures to see, crafts to do, a puppet show to watch, a paw paw trail to explore and the chance to get up close and personal with butterflies. 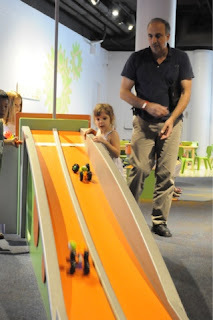 It was a fun, educational way to spend a few hours and our 3 year old loved it. Cost: $6 per person, (2 and under free) Look for buy 1 get 1 free admission coupons in your coupon books, we had one we used.